“R302.7, Technical Requirements.” Proposed Accessibility Guidelines for Pedestrian Facilities in the Public Right-of-Way. US Access Board, Department of Justice (2011). Asphalt is the most common street material, and the least expensive to implement. Asphalt street surfaces are prone to deforming under the weight of a bus, especially during acceleration and braking. Thick courses of asphalt can address this issue, but concrete bus pads are usually needed at stops and stations. Asphalt is not recommended for streetcar rail beds. Lawrence G Lovejoy, et al. 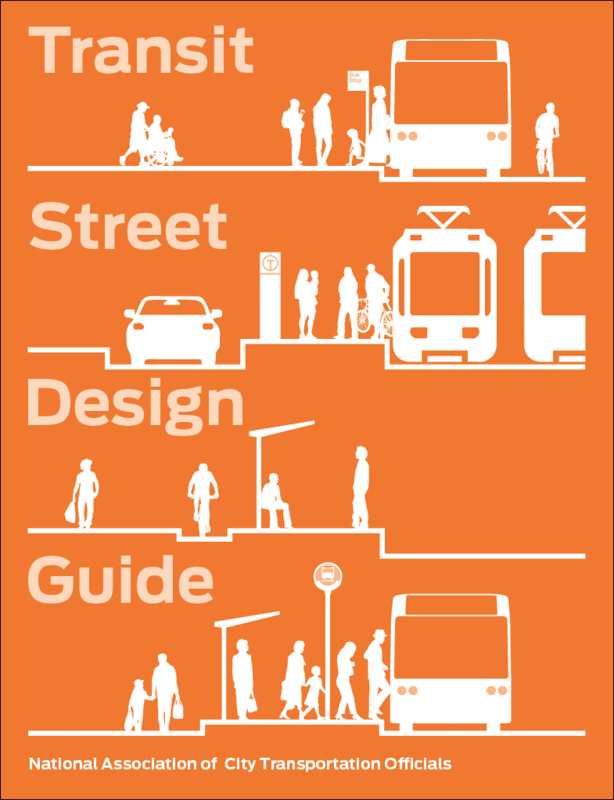 Track Design Handbook for Light Rail Transit, Second Edition. TCRP Report 155, Transportation Research Board (2012). 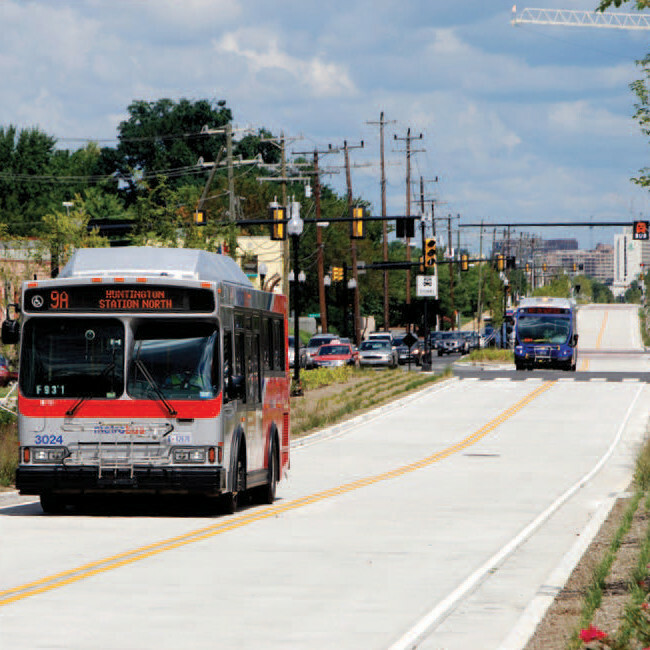 Concrete street surfaces are recommended for streets with heavy bus traffic, as concrete is stronger than asphalt and less liable to shifting under the heavy weight of buses. Concrete is more expensive but lasts longer than asphalt. Especially in warm weather cities, concrete may have a lower life cycle cost than asphalt. High early strength concrete can allow service to return within several hours of paving. Steven H Kosmatka, Beatrix Kerkhoff, and William C Panarese. “Ch. 17: High-Performance Concrete,” Design and Control of Concrete Mixtures, 14th Edition. Portland Cement Association (2003). 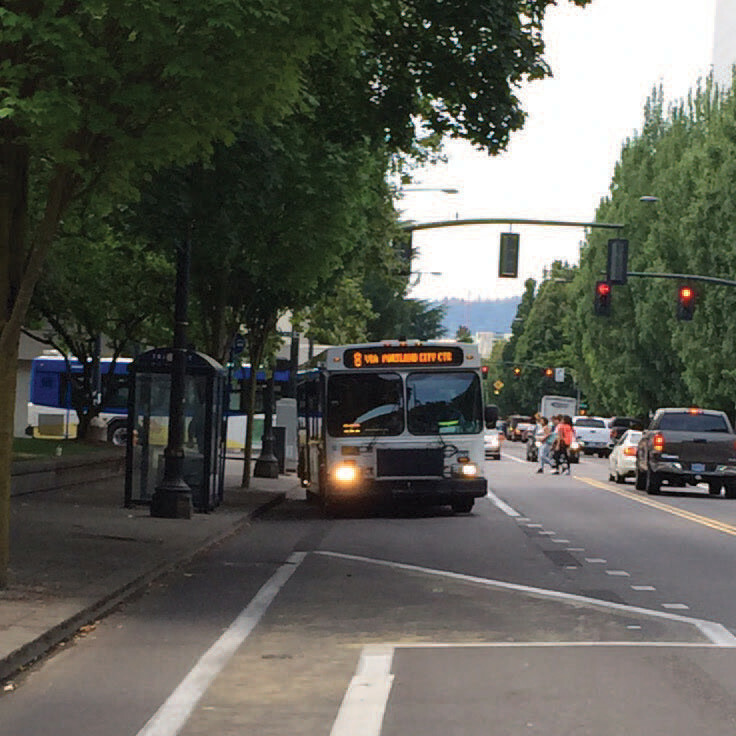 Where a bus route or lane is asphalt, concrete bus pads are recommended for locations where buses brake, including transit stops, signs, and traffic signals. Embed rails in concrete to avoid track shifting and service interruptions due to resurfacing and other maintenance. Distinctive paving enhances the transit streetscape, announcing the presence of a special urban realm, and extending the feel of public space from the sidewalk into the street. In large shared areas and plazas, pavers of different colors, textures, and orientation can be used to indicate where to expect transit vehicles. 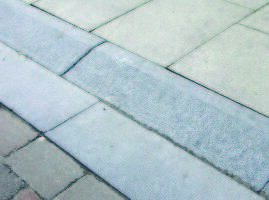 Pavers are applicable to running ways, and streets where enhancing the public realm is desired. They are especially useful in shared plazas and transitways. Large unit pavers made of concrete, brick, or stone (typically granite) are durable, and can be used for bus running ways or rail beds. London Bus Lane and Bus Stop Construction Guidance. Local Government Technical Advisers Group. London, UK (2013). 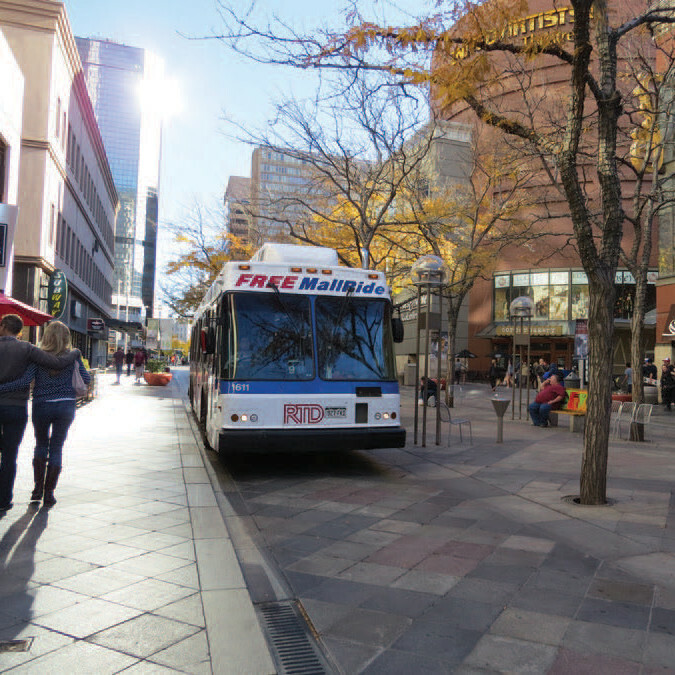 Bricks and pavers are broadly applicable with streetcars, though may buckle under the stress of buses and heavy vehicles, especially where vehicles accelerate (stops and intersections). Large block pavers distribute force from large vehicles turning and accelerating. Additionally, diagonal or interlocking paver configurations better distribute loads than square configurations. Ensure pavers have adequate friction and skid resistance for people walking and biking. Pavers, like all pavements that pedestrians access, must be level and maintained for accessibility. “R302.7, Technical Requirements.” Proposed Accessibility Guidelines for Pedestrian Facilities in the Public Right-of-Way. US Access Board, Washington, DC: 2011.